Filter by Standard Legend Ed. Deluxe Ed. 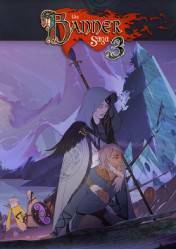 The Banner Saga 3 is the third installment of the Viking-themed and narrative RPG franchise in which we will face numerous challenges for our tribe to survive. Our people will face the greatest challenge of all as the darkness approaches. To deal with the terrible threat, we will have the Dredge Ally package to help us strengthen our ranks. This pack includes the exclusive dredging character Kivi (Stoneguard Rank 10 Hero) with tank fighting ability. It also includes its Sculptor Tools that give it the passive ability to Return the Favor, the exclusive Dredging Heraldry and the heroic title of Intelligent Shield. Witness the Banner Saga as you've never seen it before as a dark force takes over everything you've come to know. New playable characters will be available with new upgrade options as we move forward in the battle. A deeper strategic combat system against a host of new enemies: the valka spear and heroic titles allow players to further customise their style of play. This is probably one of the most underrated vikings themed based rpg since the blizzard game. Interesting story, good gameplay, good game overall. Banner Saga 3 Review "Buy, Wait for Sale, Rent, Never Touch?"